A brand new tale in the world of Monkey Island is out. After a short walk down memory lane, I sat down to play the Tales of Monkey Island series. 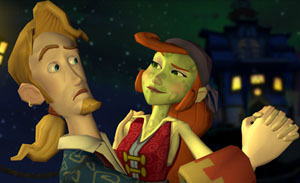 Tales of Monkey Island is a single story released as five episodes over the course of six months. I was happy to have an old school style adventure game for today's world, but unfortunately the game lacked some of the polish I'd expect from a non-episodic adventure. When playing the older games today, getting them to run was an adventure of its own. I wouldn't have expected any issues with such a brand new game, but alas I did have one serious issue. My game machine is not powerful enough to run the game at full capacity. I had to knock the quality setting down from 6, the default, to 3 before I could get beyond the title screen. TOMI comes with no documentation; not even a PDF. It was only through trial and error I was able to find the quality setting and change the setting. This took about an hour, because moving the mouse smoothly across the title screen was not possible at any setting higher than 6. It was a jagged movement, as if the screen only had 6 pixels. Once I figured that out that initial problem, I was able to start the game, things went much smoother. Thankfully each new episode was able to 'find' my settings from the previous episode and I did not go through the same setting nightmare each time. There is an interesting option in the settings named hint frequency. I wish some documentation would tell me what that means, but I assumed this somehow related to in game hints. I turned it all the way down in hopes of making the games more challenging. By my estimate I spent 5-8 hours on each chapter, slightly more than the estimated 2-4 hours per chapter. I only turned the hints higher at one point in Episode 5 was I was ungodly stuck. It turns out my issue there was a missed screen exit. Once I discovered that exit, I was able to easily solve the puzzle at hand. At some points in the game you do have to walk right at the screen. Getting around in the game will be quite easy, especially if you've played other games in the adventure genre. Unfortunately instead of pointing and clicking to move around, you have to hold down the mouse button and move the mouse. It aggravated my wrist occasionally, but for the most part was not too bad. Beyond that, the game sports the traditional point and click to interact with items. The game starts out on a ship, and in order to make it seem realistic, the ship actually bobs back and forth on the waves, moving both your view of the scenery and the hotspots you need to click on to and fro. This is a cool effect that you get used to pretty quickly, but I think they should have introduced the game, and therefore the interface in some other manner. Guybrush Threepwood, our hero, getting ready to fight LeChuck , our villain, with the Cursed Cutlass of Kaflu. Guybrush just needs to finish up the voodoo spell; which doesn't go as planned. LeChuck turns into a human and his demon essence floats throughout the Caribbean infecting pirates. 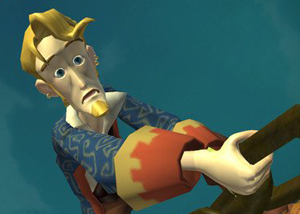 Guybrush ends up on Flotsam Island with a cursed hand. On Flotsam Island all winds blow towards the center of the island, meaning no pirate can ever leave. It is up to Guybrush to find a boat and crew and to solve the wind problem so he can escape and find out what happened to LeChuck and Elaine. The game plays much like a traditional adventure game. The puzzles are logical enough, often based on using or combining inventory items that you collected along the way. Some require more thought such as solving the map puzzle in Episode 1, and a different map puzzle again in Episode 4. I was impressed with the amount of locations in each game, as I expected them to be heavily watered down due to the time constraints of creating an episodic adventure. Guybrush's search will lead him to meet up with many old favorites such as Stan--now a lawyer, The Voodoo Lady, and Murray the Demonic Skull. It also introduces the best character to grace a Monkey Island game since Murray: Morgan LeFlay the female pirate hunter. Morgan, like you and I, is a fan of Guybrush. You might even say she has a bit of a starry eyed crush. 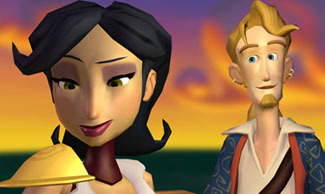 The two characters play off each other fantastically; in some cases, it mirrors the interplay between Elaine and Guybrush from Escape from Monkey Island. Episode 1 focuses on Guybrush getting a boat and getting off of Flotsam Island. Episode 2 and 3 focuses on Guybrush finding La Esponja Grande, a magic voodoo talisman to help get rid of the Pox of LeChuck. Episode 4 focuses on using La Esponja Grande in a Voodoo spell; and episode 5 finishes off the story with a final showdown. Episode 5 has a real treat, where you get to play Guybrush as a Ghost and a Zombie, mirroring the first two incantations of LeChuck. As with many stories, the game raises more questions than answers. It calls into doubt the true intentions of the Voodoo Lady, and she takes a much larger role than in previous games. The characterization of Elaine seems to back flip between the character we all know and love to someone with intentions not quite as clear. Each episode progressively improved in gameplay and story, until episode 5 where the characterization of Elaine slipped and none of the questions raised were ever answered. In episode one you can find treasure maps on-line and explore the jungles of Flotsam Island for more treasure. I thought that this was a great way to add replay value and was disappointed this option was not introduced in future episodes. Even so, while traversing the jungles using a creative map system was fun the first time; it wasn't enough to get me to go through again. The first treasure was a special background for your computer. I thought it was a novel attempt to add replay value to the game and to provide additional benefit to the customers. I guess now I go into the waiting game. I'll probably replay through the game, possibly on a better computer with higher quality settings, around the time that Tales of Monkey Island 2 comes out, and I hope there is a sequel. I greatly enjoyed the adventure despite the questions it raised. I hope it is leading somewhere and I look forward to joining Guybrush on another adventure, hopefully next year.